If you're looking for one of those "healthy-tasting" desserts, this is it. Extremely light in both taste and texture, these baked pears served warm are the perfect ending to a heavy or very savory meal. They are also super easy to make, and you can have these done and on the table in less than 30 minutes. Pears are halved and baked in a pear nectar-honey mixture for about 20 minutes (I think this depends on the ripeness of the pears; mine weren't very ripe and needed about 30 minutes of baking time), then filled with a cream cheese and crystallized ginger mix...which is then topped with more ginger and crushed pecans. The recipe calls for the pecans to be toasted, which I forgot to do, but I'm not sure it made much of a difference. 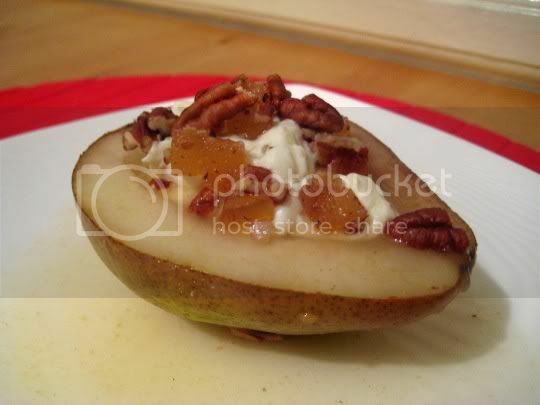 The uniqueness of this dish is the sweet, mild, and earthy pears with the tangy saltiness of the cream cheese and the sweet-spicy ginger flavor. Even the texture differences make this interesting: juicy but firm pears, soft and creamy cheese, and the intermittent crunch of pecans. It's quite a combination that will keep you going back for more...and before you know it, you've eaten two whole pears! How's that for getting your 5 a day? Make again? Definitely. It's a quick dessert fix, and would be a nice and interesting twist for the holidays.